Sam was a child always looking for his Father. His purpose in life was to become one. He loved to walk around and meet new people. He was always going to visit friends and check up on his parents. Sam had so many dear friends and was a legend around the neighborhood for his many exploits. He was a big guy with a full heart and he encouraged everyone he knew to be the best they could be and to try harder to achieve a life of meaning and purpose. Sam was strong to the end and fought to stay with us as long as he could so that he could see his children grow up. He grew up in the East End on Godwin St. and liked to say it was a God Win! He was always happy running around with his friends and playing basketball and street football games. He was the school photographer and editor of Stephen F. Austin Sr. H.S. as well as Editor of the Houston Community College and Sierra Club newspapers. He was an artist as a youth and poet and he loved to cook. Sam had many ideas he held dear. He believed strongly that children deserved a chance to live and he never faultered from making his voice heard no matter if he was politically correct or not. Sam was a music lover and he had a kind soul. He loved to make people happy. Sam was a hero to many. Most of all to his family and he will be forever missed. Sam was a beloved husband, father, son, brother, and friend. He leaves behind his wife, Obdulia; three children, Jude, Katya, and Page Plant; parents, Maria de Lourdes and Jose Antonio Castaneda of Houston, TX; brother, Joel Castaneda; sisters, Mercedes Mayne and Andrea Tillman; many nieces and nephews; grandmother, Carol Orozco; aunt, Marie Diane Robbins; uncles, Frank, Eddie(Godfather), and Jimmy and their families. Our extended family for many years, the Ledesma family is missing their big brother as well. A Memorial Service will be held on Wednesday, April 17, 2019 at 6:00 p.m. in the Miller Funeral Chapel, 7723 Beechnut, Houston, TX 77074. 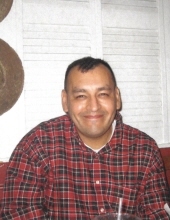 To send flowers or a remembrance gift to the family of Sam Castaneda, please visit our Tribute Store. "Email Address" would like to share the life celebration of Sam Castaneda. Click on the "link" to go to share a favorite memory or leave a condolence message for the family.